Compression wear seems to be taking the animal world by storm. We are not trying to be humorous here because this information is verifiably all true. It started with compression suits for racing horses and dogs and just recently racing camels have joined the ranks of athletic animals wearing compression gear. In the oil rich and ultra-wealthy country of the United Arab Emirates, a company by the name Al Shibla Middle East has emerged. This company specializes in high end products for horses and camels. 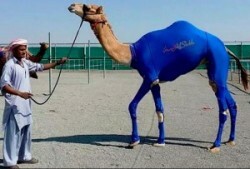 Very recently they have come out with a new line of compression suits specifically tailored for camels. You are probably wondering why in the world a camel would need to wear a compression garment? Keep on reading and you will find out that there actually is a purpose behind this seemingly funny and admittedly somewhat weird display of a camel in a compression suit. The company marketing the compression suits suggests that similar to the suits already in use for horses, compression can be beneficial for camels as well. Comparable to compression stockings on humans, the camel compression garments are designed to stimulate blood circulation and enhance the racing performance of the animals. Camel racing has a very long standing tradition in many Middle Eastern countries and stable owners are always looking for ways to keep their racing camels at peak performance. Traditions in the Middle East currently permit wearing of the compression suits only before and after races but not during an actual competition. What are the Benefits of a Camel Compression Suit? It minimizes joint and muscle aches also known as delayed onset muscle soreness (DOMS). The compression suits have already been in use for some time with horses and racing dogs and have earned the reputation as a revolutionary piece of sporting technology. These stretchy suits for camels have received a great deal of interest from the stable owners of racing camels. The company is also working on an actual racing compression suit for camels, which would be worn during a race. Unfortunately long-standing traditions and established customs will not permit racing camels to wear the suits during a race at this time. In Australia and other western countries it is common practice to have dogs and horses wear these types of suits before, during and after races.